So, what exactly is this new liner technology that everyone's talking about? Learn how to install the XR QuikLiner product in your plant. It's very easy to use. You can slide the liner over a form and pour it. 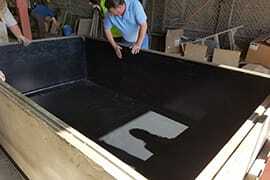 It's invaluable to have another layer of protection, which is a real benefit to our customers. 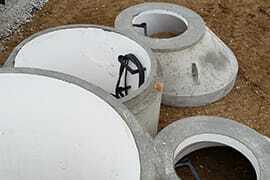 I think XR QuikLiner will revolutionize septic tanks and manholes. I wasn't sure how well it would bond, but it bonded very well. I do believe in XR QuikLiner, and I see us using more of it as we get into more applications. There's no doubt that in this industry, if you get caught standing around, you're going to get passed. I could see the XR QuikLiner being very effective. XR QuikLiner really takes out a lot of the guesswork of quantities for the mixes and leftovers. 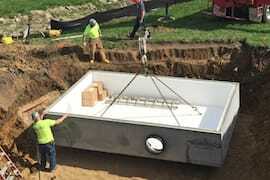 A 2017 Grande Cheese broke ground on a major expansion of its cheese processing facility in Juda, Wisconsin, requiring an 8,000 gallon wastewater holding tank, and three manhole distribution risers. Dalmaray didn’t have the three weeks typically needed to cast, set, pretreat, coat, and cure all the pieces. Second generation owner Chuck Babbert of E.C. Babbert continues his father's desire to provide the best precast concrete products possible through great quality, customer service, and innovation.